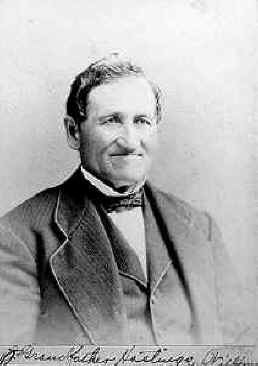 William Hastings b. March 4, 1813 in Windham, Vt. d. February 21, 1896 in Brookline, Vt.
William was born and raised in Windham, Vermont. He was the oldest son in a brood of thirteen children. He attended the District School and, at age 20 , left to find work in Boston, where he remained for a “few seasons.” This was probably an attempt to discover whether there was life beyond the farming ways that his [our] branch of the family for at least six generations. For better or worse, he eventually realized that his roots were firmly on the farm. Interestingly, he must have been there in 1834 when a silk worm “mania” swept Connecticut and then the rest of New England — save Maine. Throughout the region, rural people and urban investors were captivated by the supposedly “sensational profits” that farmers could make off of some Mulberry shoots and a colony of cocoons. Eventually it was discovered that New England was too cold for the silkworms and the mulberry bushes were allowed to go wild. By 1841, the craze had dissipated. While William may have participated toward the middle or the end, he missed the early apex of the craze. The Boston of this time was a bustling city of about 50,000. Recovering from the 1832 fire, it was a city of modern convention and contraption, and a place of great tension. The latter was manifested by the 1834 anti-[Irish] Catholic riots. Tension also came from the fact that Boston had become the pulpit for William Lloyd Garrison’s American Abolition Movement. His periodical, “The Liberator”, attracted free and fugitive blacks to a state that had previously had few. Citizens, while sympathetic to abolition in theory, did not universially embrace this migration. This was a time too of religious reformation. The more liberal congregationalists, under William E. Channing, started in 1819 to form a new creed called Unitarianism. Undoubtedly, William considered this new faith before deciding, as he ultimately did, to stay with the church of his fore-fathers. By 1836, William returned to Windham and bought a farm in the adjacent village called Jamaica. Jamaica had a population of about 1560, making it over twice the size of tiny Windham. On December 6th of that year, he married Susan Goddard, a daughter of Enoch and Esther (Bliss) Goddard of Windham. She was a distant cousin (which he may or may not have known) and a fellow descendant of old Watertown stock. In about 1861, Susan’s niece, Sarah Ellen Goddard (1860-1914) also joined the family. Timothy Goddard had lost his wife, Fannie J. Abbott, shortly after Sarah’s birth and could not care for the infant on his own. Sarah remained with the family until her marriage to Fred Coombs in 1879. William was active politically and an “old time” Whig. He was a founder and officer of Jamaica’s West River Bank, formed in 1854. This bank operated for about 20 years and then reorganized into the Jamaica Savings Bank of which William served as a Trustee from 1876 until his death. He also served as a Town Selectman. He farmed 170 acres with his son Willie and another 226 with brothers Henry and Horatio Felton. Henry was a relatively properous owner of two saw mills in Jamaica. Along with his farming peers, William was probably a member of the “Patron’s of Husbandry”, which met at Jamaica’s Sunnyside Grange # 147. In the 1850 census his estate was valued at $1500. Jamaica was beset by a number of climatic and political traumas during his years there. The devastating flood of 1869 did much physical damage and compounded the town’s financial dilemma of leftover Civil War debt. Nationally, money was tight because of scandals like “Black Friday” (September 1869) and the Credit Mobilier of America scandal (1873). This put many a hill farmer on the brink of financial ruin since they traditionally operated, at the best of times, on a very thin margin. Finally, the “snowiest” April on record hit New England in 1874 — dropping up to 60 inches of snow in parts of Vermont and New Hampshire. This spate of bad luck, and the seemingly boundless opportunities in the West (as touted by people like Horace Greely), caused many of Jamaica’s young to strike out to improve their lot. William’s son Almon [my great-grandfather] was one, he left in 1870, stopping for a year in Mozomanie, Wisconsin, (probably staying with his uncle Bliss Goddard), and eventually buying a farm near the town of Jefferson, county seat of Greene County, Iowa. In 1884, William and Susan moved to nearby Brookline to live with daughter Frances and her husband, Chas. Stickney. They remained there until their deaths. At 9PM on 21 February 1986, William died suddenly and unexpectedly while on Frances’ front porch heading for the barn. Susan, “a woman of energy and refined taste”, died on 6 May 1900 after a four month illness. In the end, she was cared for by Frances and Sarah (Goddard) Coombs. William and Susan were laid to rest in Brookline’s Riverside Cemetery. Sources: Primarily William Hastings’ obituary; Susan Goddard’s obituary; Historical Notes, Jamaica, Windham Co, Vermont, by Warren Booker, 1940; Gazeteer & Business Directory of Windham Co, VT, 1724-1884, by Hamilton Child, 1884; Vermont Historical Gazetteer, A Local History of All The Towns in The State…, Vol. V, by Abby M. Hemenway, 1891; and other personal family information.